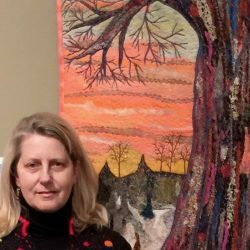 The Greater Ann Arbor Quilt Guild is a sponsor of SafeHouse Center of Washtenaw County. SafeHouse provides free and confidential services for those who live or work in Washtenaw County impacted by domestic violence and sexual assault. 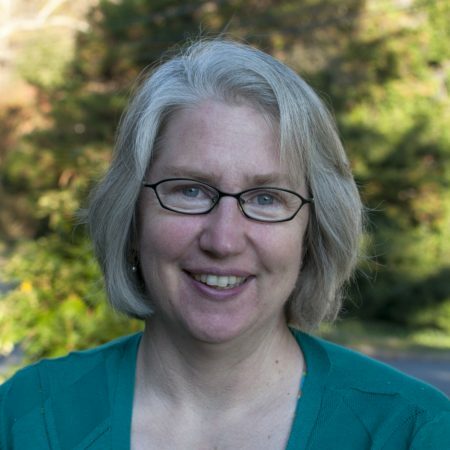 Their services include emergency shelter for those in danger of being hurt or killed, counseling, legal advocacy, support groups — and especially hope. Each person who resides in the shelter leaves with a donated quilt. GAAQG supports this charitable organization by donating quilts and raising funds. We hold sales of donated fabric with proceeds supplementing our fundraising efforts for SafeHouse. A portion of the members’ annual garage sale also supplements our efforts for SafeHouse. And each year we collect cash donations to SafeHouse from members and non-members. 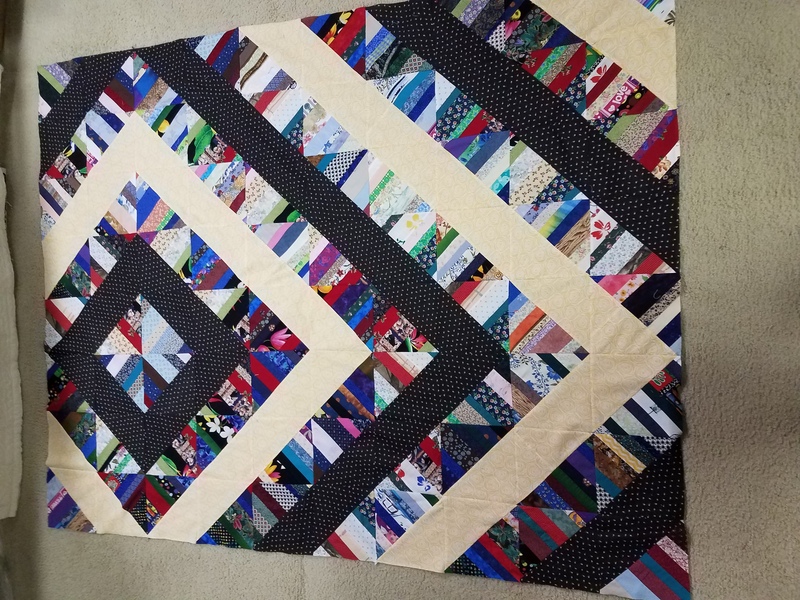 As a thank-you for these cash donations, for each $10 donated, the donor’s name is entered in a drawing for one of three fundraiser quilts, which have been made and donated by guild members. As part of membership, GAAQG asks each member to donate a quilt yearly to SafeHouse. Quilts are collected at every meeting. In 2017, GAAQG donated 276 quilts. Click on the links below for helpful information. Many thanks to all our members who so generously donated their time, fabric and money to create beautiful quilts that demonstrate to SafeHouse clients how much we care! Click here to see how many quilts we’ve donated since 2009! 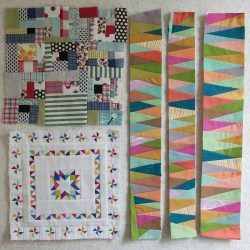 Construction guidelines are available, listing several helpful hints for everything from planning your quilt to getting it ready to donate. Labels are available for your quilt, showing the recipient that it was donated by GAAQG. Batting is available at meetings, through a generous charity batting program offered by the Hobbs Fibers Company. Longarm quilters within the guild are available to quilt your quilt, at a reduced rate or even no charge. Patterns are available for some easy-to-do quilts that will help you use up your fabric stash. Donate fabric to the SafeHouse fabric table. This fabric is available to guild members, donated by guild members and others, to use in SafeHouse donation quilts. If you see a selection of fabric you just have to have for a project for yourself, you are able to purchase it, with the proceeds being added to our yearly donation to SafeHouse. Attend a SafeHouse sewing day. A couple of times a year, we get together after the meeting to make quilts for SafeHouse. Each event has a theme. You can work individually on your own quilt, or you can work in a group. If you don’t want to bring your sewing machine, you can cut fabric or press. These events are great fun, and it’s amazing to see how many quilt tops can be made in a short amount of time when we all work together. Come when you can; leave when you must. Take a pre-packaged “kit” of fabric home and add your sewing skills and a little love to create a quilt top or even a completed quilt. These kits are put together with fabric from the SafeHouse table and include an easy pattern to use. 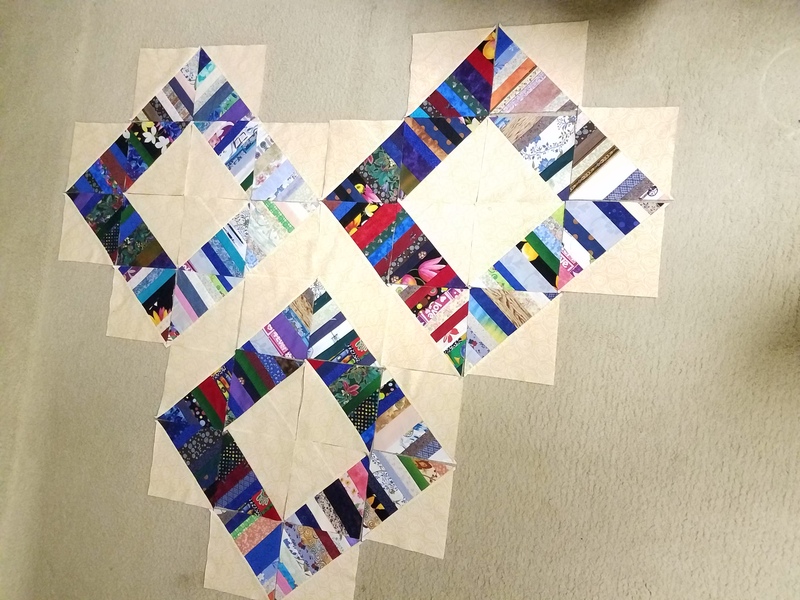 Do a little work on a quilt in progress, e.g., members sometimes contribute a quilt center that needs a few borders to complete, or you might pick up a quilt top that is complete but needs to be quilted, a good way to practice your free-motion quilting skills. 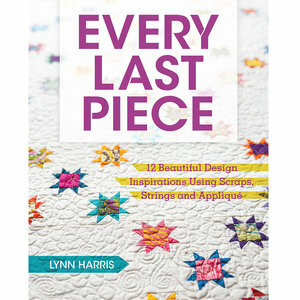 While it is most desirable that you complete the quilt that you take home, don’t feel that it is a requirement. An option is to take a quilt top home, do some work on it, and return it for someone else to finish. Collect cash donations for our fundraiser quilts. Be sure to inform potential donors that a $10 donation gets them a chance to win three different quilts. 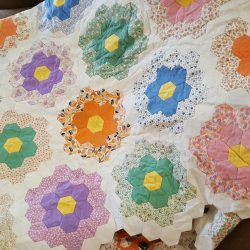 Donate a quilt to be used as a fundraiser quilt. Save and turn in your UPC labels from your Hobbs packaged batting. The guild uses these to get discounted prices on batting used for SafeHouse quilts. NOTE: SafeHouse is an Amazon affiliate. By visiting Amazon.com via this link, all the shopping you do there will benefit SafeHouse, at no cost to you. Use this link as your Amazon bookmark. Standard twin size or larger quilts are preferred. The minimum acceptable size is 60″ x 80″. Your quilt may be designed in masculine, feminine or neutral colors, for children, teens or adults. Remember that there are both boys and girls who are sheltered at SafeHouse. Primary colors are good for little boys; pink and purple are favorite colors for little girls. Use sturdy fabrics and good thread. If you are tying the quilt, use strong methods. Machine tacks may be preferable to hand-tying so that little fingers don’t get caught in a tie’s loop. Plan for the quilt to endure hugging, tugging and frequent washing. Don’t attach small items that might be a choking hazard to toddlers. Before you turn in your quilt, check for stray pins, needles or loose threads. You must sew a GAAQG label to the back of the quilt before you donate it. Labels are also available at Quilt Day. A very generous charity batting program offered by the Hobbs Bonded Fibers Company allows our guild to purchase 30-yard rolls of batting at a significant discount. Batting will be cut to size and provided to members at no cost, for use in SafeHouse donation quilts only. The batting offered will be Polydown, a premium 100% polyester batting. For each roll of batting we purchase, we need to submit five UPC labels from Hobbs packaged batting. This program is being financed with proceeds from our other SafeHouse fundraising activities (fabric sales, garage sale). No membership dues or guild operating funds will be used to purchase batting. You will be asked to provide your name and contact information in order to document that the batting you take is used only for SafeHouse donation quilts. Your contact information will only be used for the guild’s records; it will not be shared with the Hobbs Company. At each Quilt Day meeting there will be a box at the Admissions Table and at the SafeHouse batting table to collect your UPC labels. Having sufficient labels is essential to our ability to participate in this program and obtain the batting we need. NOTE: for Hobbs Tuscany Collection, there is currently no UPC label. For these packages, please turn in the paper insert that identifies it as Hobbs Tuscany Collection batting. 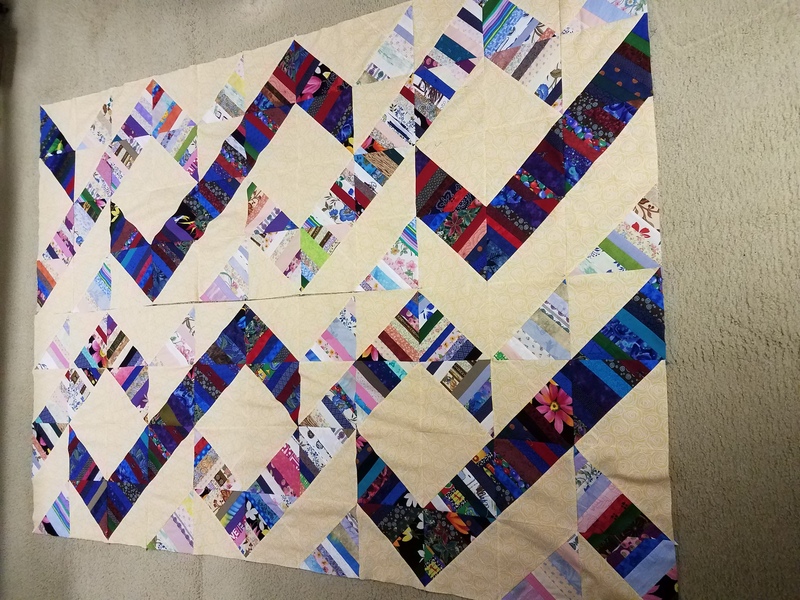 At each Quilt Day meeting there will be battings precut to 72” x 96”. These are available on a first-come, first-served basis. If you are in need of a larger sized batting, please send an email to the SafeHouse batting coordinator at safehousebatting@gaaqg.com. Send your request at least a week prior to Quilt Day to allow time to get the batting ready for you. If you quilt more than TEN SafeHouse quilts throughout the year and would prefer a full roll, contact the SafeHouse batting coordinator at safehousebatting@gaaqg.com and request a full roll. If your questions were not answered here, please send an email to safehousebatting@gaaqg.com. Are you a long-arm quilter willing to quilt SafeHouse quilts? Jean has a number of variations on her ‘Scrappy Half-Square Triangles’ quilt pattern. These directions are written to make a finished quiIt measuring 60″x72′′, 8 blocks across by 10 rows down. The finished size of the bIock is approximateIy 7-1/2″. 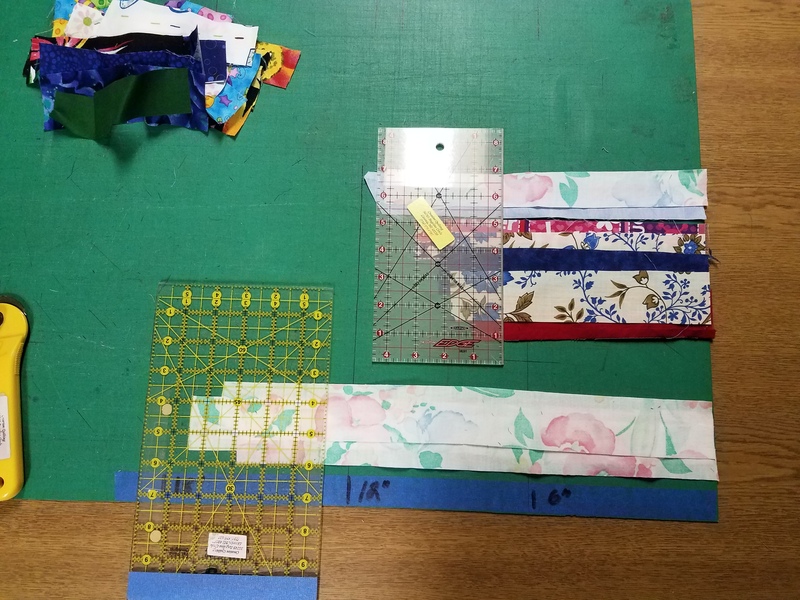 lf you wish to make any of the bIocks a solid background, measure your 1/2 square block and cut the background strips according to this measurement. Click on the following links for directions and photo examples. This quick and easy pattern ‘blooms’ with 16 floral 5″ four-patch blocks (finished to 10″ square) alternating with 10″ finished black (or other solid color) squares. Two side vertical 8″ borders finish it to 60″ wide x 80″ long, the minimum required for SafeHouse quilts. This stash-buster quilt is quick and easy and finishes to 61″ x 80″ including 2″ borders. 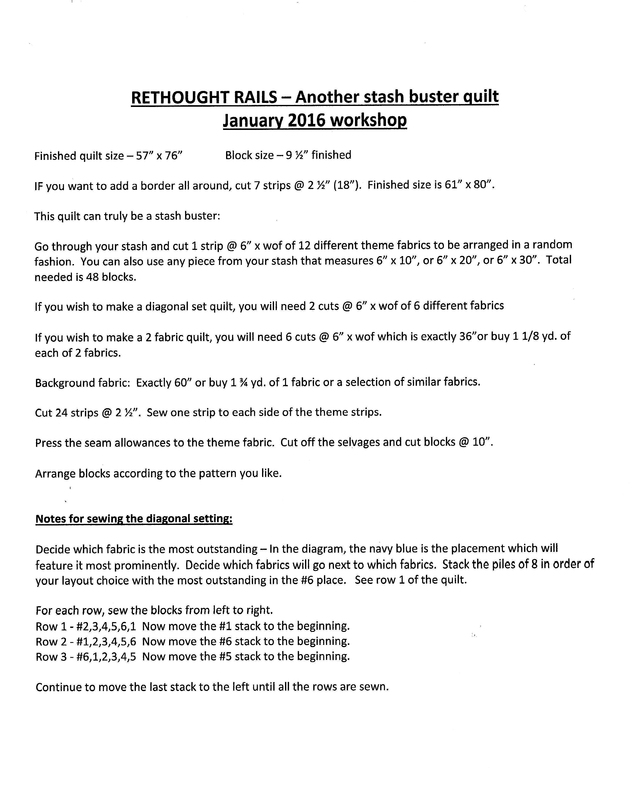 It was used as the pattern for the SafeHouse sewing session following our January 2016 meeting. The 9.5″ finished squares can be set in a variety of settings. We show three here on Page 2 (below) but you can probably come up with even more! You will need to make a minimum of 35 (12” square) blocks to meet the SafeHouse quilt requirements. All you need are three fabrics, light, medium and dark! You will need to make a minimum of 80 (8” square) blocks to meet the SafeHouse quilt requirements. Pick two colors and away you go! You will need to make a minimum of 35 (12” square) blocks to meet the SafeHouse quilt requirements. Pick two contrasting colors and away you go! 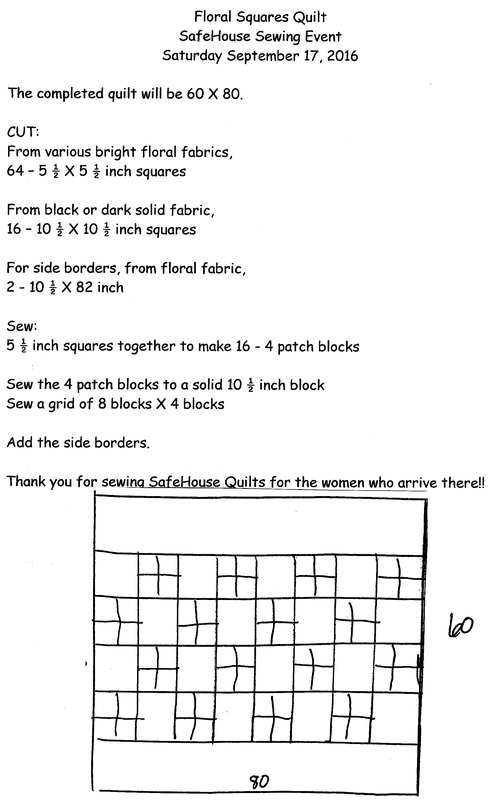 With a 3″ border, you will need to make a minimum of 140 (6”square) blocks to meet the SafeHouse quilt requirements. And of course, you don’t have to use floral fabric. Use whatever focus fabric you want to! You will need to make a minimum of 80 (8” square) blocks to meet the SafeHouse quilt requirements. As a challenge, make this a scrap quilt using dark and light fabrics! You will need to make a minimum of 35 (12” square) blocks to meet the SafeHouse quilt requirements. A wonderful use for all your fabric scraps!